Bake It, Don't Fake It! Create show-stopping desserts and get them on the table in no time with this fully illustrated, step-by-step guide from the Rachael Ray Presents line. Looking to impress your friends and family with decadent desserts but afraid you lack the skills to pull it off? Are you reaching for that packaged cake mix and can of frosting instead of whipping something up from scratch? Fear no longer— we’ve got the fix for you. Heather Bertinetti, a talented pastry chef with years of experience in Manhattan’s top eateries, is sharing her insider tips for how to make restaurant-worthy desserts right in your very own kitchen. Bake It, Don't Fake It! is filled with recipes perfect for the home cook, such as Bourbon- Chocolate Pecan Pie, Strawberry Daiquiri Truffles, Red Velvet Macarons, and PB&J Whoopie Pies. Once you learn the whys and why nots of baking, you’ll be able to get creative and give all of your favorite treats a special touch. As an added bonus, you’ll find Heather’s “Chef It Up!” tips throughout the book, where Heather reveals her tricks for giving homemade desserts the wow presentation factor. All of the equipment you’ll need is probably already in your kitchen and all of the ingredients are readily available in your local supermarket, so it’s time to get baking! Bake It, Don’t Fake It! Everyone needs a good go-to yellow cake recipe in their recipe file. Yellow cake has become the most common birthday cake flavor. Its neutral flavor profile allows the cake to be dressed up with any filling and frosting from chocolate to fruit. This recipe is moist, buttery, and perfectly simple. Preheat the oven to 350°F. Line the bottoms of two 9 x 2-inch cake pans with parchment paper rounds. Coat the pan and paper with cooking spray. In a medium bowl, whisk together the flour, baking powder, baking soda, and salt. In a separate bowl, whisk the buttermilk, sour cream, and oil. In a stand mixer fitted with the paddle attachment, cream the butter and sugar on medium speed until light and fluffy. Reduce the speed to low, add the whole eggs one at time, beating well after each addition. Beat in the egg yolks and vanilla until incorporated. On medium speed, alternate adding the flour mixture and the buttermilk mixture to the batter in several additions, ending with the buttermilk mixture. Scrape down the bowl with a rubber spatula and beat until the batter is blended well. Scrape the batter into the prepared pans and place both pans on the same oven rack. Bake until the cake springs back to the touch and a cake tester inserted in the center comes out clean, 30 to 40 minutes; rotate the pans from front to back halfway through. Let the cakes cool completely in the pans before filling and frosting. Coconut Cake: Spread the bottom layer with Coconut Custard and top with the second layer. Frost the top and sides with Swiss Buttercream. Lightly toast shredded coconut in the oven and cover the cake (top and sides) with the toasted coconut. Strawberry “Shortcake”: Spread the bottom layer with a thin layer of raspberry jam. Top with Whipped Cream. Top with 1/2 cup sliced strawberries, keeping them toward the center (you don’t want them poking out when you put the top layer on). Put the top layer on and frost the top and sides with more whipped cream. Shave white chocolate curls on top. Many batters start out with a base of butter, sugar, and eggs to which are then added the dry ingredients and the wet ingredients. Typically the “dries” (flour, baking powder, baking soda, cocoa powder, etc.) are mixed together in a separate bowl. And the “wets” (milk, juice, oil, flavorings, or other liquids) are mixed together in yet another bowl. The dries and wets are then added alternately to the creamed butter and sugar. The reason for alternating their addition is to make a smooth batter. If you were to add all the wets first, followed by the all the dries, the batter would not be homogeneous; the fat would be separated out and the resulting cake would be greasy and flat. Heather Bertinetti is the talented young pastry chef working her way through some of Manhattan’s most acclaimed restaurants. After graduating from the Culinary Institute of America with a degree in baking and pastry arts, Heather joined Gramercy Tavern and, just two years later, Per Se. She then went on to open and receive rave reviews at Alto, Convivio, Marea, and Osteria Morini. Heather has been lauded by The New York Times and The Wall Street Journal, and was named in Zagat's 2011 "30 under 30: New York's Hottest Up-and-Comers." 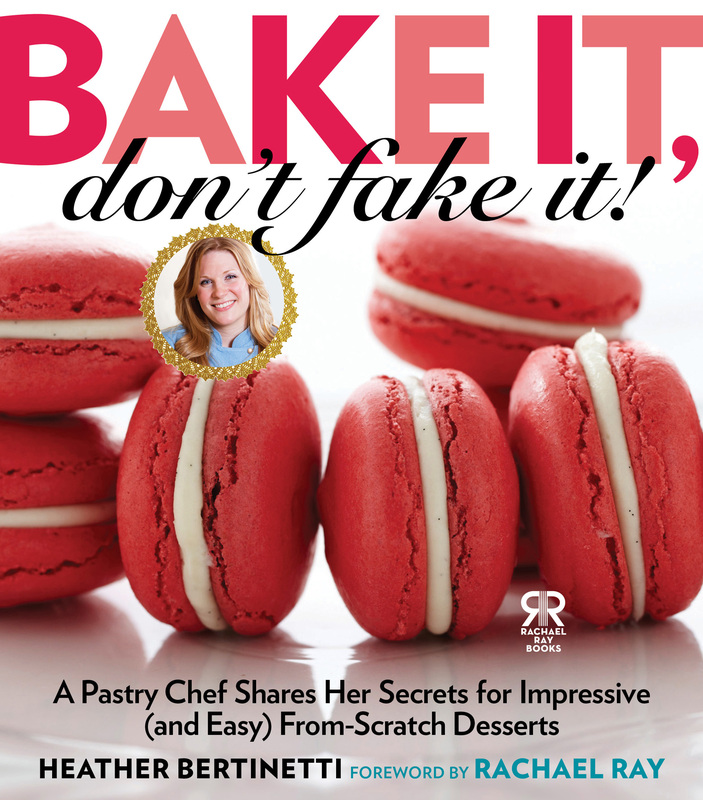 Book Cover Image (jpg): Bake It, Don't Fake It!